Frog in the Well is a vivid and revealing account of Watanabe Kazan, one of the most important intellectuals of the late Tokugawa period. From his impoverished upbringing to his tragic suicide in exile, Kazan’s life and work reflected a turbulent period in Japan’s history. He was a famous artist, a Confucian scholar, a student of Western culture, a samurai, and a critic of the shogunate who, nevertheless, felt compelled to kill himself for fear that he had caused his lord anxiety. During this period, a typical Japanese scholar or artist refused to acknowledge the outside world, much like a “frog in the well that knows nothing of the ocean,” but Kazan actively sought out Western learning. He appreciated European civilization and bought every scrap of European art that was available in Japan. He became a painter to help his family out of poverty and, by employing the artistic techniques of the West, achieved great success with his realistic and stylistically advanced portraits. Although he remained a nationalist committed to the old ways, Kazan called on the shogunate to learn from the West or risk disaster. He strove to improve the agricultural and economic conditions of his province and reinforce its defenses, but his criticisms and warnings about possible coastal invasions ultimately led to his arrest and exile. Frog in the Well is the first full-length biography of Kazan in English, and, in telling his life’s story, renowned scholar Donald Keene paints a fascinating portrait of the social and intellectual milieus of the late Tokugawa period. 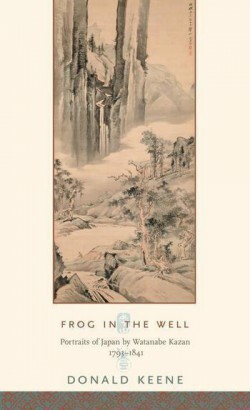 Richly illustrated with Kazan’s paintings, Frog in the Wellilluminates a life that is emblematic of the cultural crises affecting Japan in the years before revolution.